Gingival recession and root exposure have presented a therapeutic challenge to clinicians for many years. With an increased awareness, various surgical procedures have been designed to correct gingival deformities esthetically as well as functionally. An ideal periodontal plastic surgical procedure for root coverage should establish esthetics and function. It should provide a sulcus exhibiting no bleeding on probing and a depth of 2 mm or less. Over the years, various surgical techniques have been developed to achieve complete root coverage like free gingival grafts,  pedicle flaps without tissue grafts, ,, coronally advanced flap (CAF), , use of Acellular Dermal Matrix (ADM) allograft,  and guided tissue regeneration (GTR)  techniques. Enamel matrix derivative (EMD)  has been developed as a clinical treatment to promote periodontal regeneration. Periodontal regeneration has been presented in experimental human recession defect after application of EMD by Heijil (1997). The author demonstrated the formation of new cementum, periodontal ligament and bone after treating a gingival recession with a subepithelial connective tissue graft plus EMD. Based on this evidence, it seems reasonable to propose using EMD to improve the clinical outcomes of treating recession defects using the CAF. To the best of our knowledge, very few control clinical studies comparing the result of CAF with and without EMD are available in the literature. Therefore, the present study was undertaken to evaluate the effectiveness of enamel matrix protein (EMD) in combination with CAF with respect to root coverage, gains of clinical attachment level, and width of keratinized gingival (WKG) in the treatment of multiple marginal tissue recession. Twenty systemically healthy patients (25-46 years, mean age 30.40±3.78 years) with a Miller's Class II gingival recession defect ≥3 mm on the labial surface of more than one adjacent tooth (canines and premolars), having equal amount of keratinized gingiva apical to the recession and radiographic evidence of sufficient interdental bone (the distance between the crestal bone and cementoenamel junction (CEJ) as <2 mm) were selected from the Outpatient Department of Periodontics, S.P.D.C., Wardha. Every patient received initial therapy consisting of oral hygiene instructions, scaling, and root planing, professional polishing with the use of rubber cup and a low abrasive polishing paste. Coronoplasty, if required, was performed. 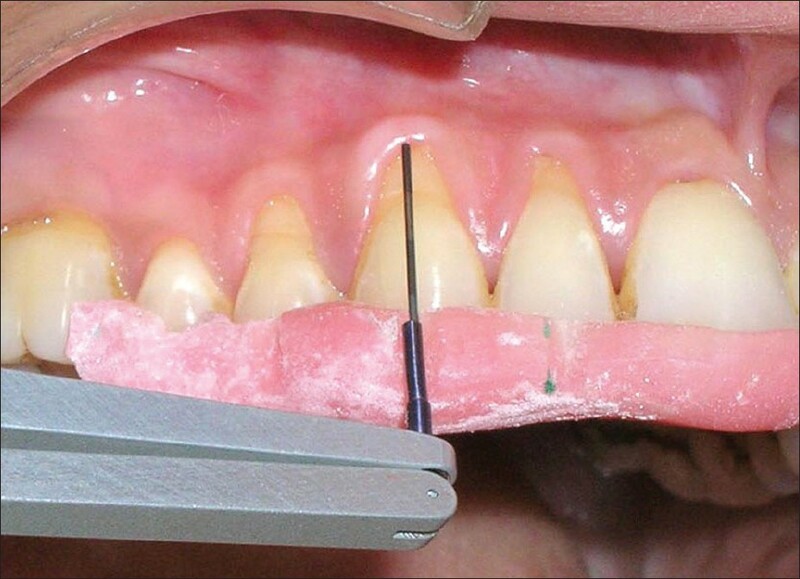 A coronally directed roll technique was prescribed for teeth with recession. Plaque control instructions were repeated until patients achieved a plaque score of equal to or less than one. The patient's plaque control and tissue response was revaluated 6 weeks later. Custom-made occlusal acrylic stents were used to standardize the probe angulations and position. Occlusal stents were fabricated using acrylic resin. The occlusal stents were made to cover the occlusal surface of the teeth being treated and occlusal surfaces of at least one tooth in mesial and distal directions. Stents were also extended apically on the buccal and lingual surfaces so as to cover the coronal third of the teeth. It was a randomized, controlled clinical study performed over 6 months. Twenty patients with a total of 46 gingival recession defects, each patient with minimum two recession defects, were included in the study. The selected patients were randomly allocated by a coin flip to test and control groups. The test group consisted of 10 patients, 6 males and 4 females (mean age 30.40±3.78 years) with 22 recession defects. The control group also consisted of 10 patients, 6 males and 4 females (mean age 35.40±6.74 years) with 24 gingival recession defects. The test group was treated by EMDs (Emdogain gel® ) in combination with a coronally positioned flap, while the control group was treated with 24% ethylenediaminetetraacetic acid (EDTA; Prefgel® ) in combination with coronally positioned flap [Figure 1]. Six to eight weeks after the completion of initial therapy, on the day of the surgical procedure, prior to surgery, recording of clinical data was carried out by the same examiner in all the patients. For evaluation of oral hygiene and gingival health, full mouth Plaque Index (PI) and full mouth Papillary Bleeding Index (PBI) were obtained at baseline, and 3 and 6 months after surgery. The following clinical parameters were recorded for assessment of the results. 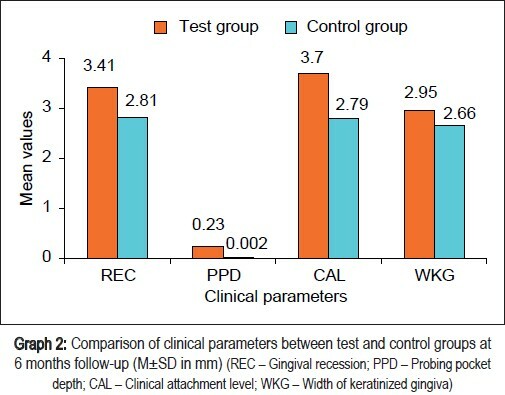 The probing pocket depth (PPD), clinical attachment level (CAL), and gingival recession (GR) were measured with a computerized constant pressure probe, i.e. Florida probe (Florida Probe Corporation, Gaineswille, FL, USA) with a constant probing force of 15 g (pressure 154 N/ cm2), tip diameter of 0.45 mm, precision of 0.2 mm, and a probe length of 11 mm. These clinical parameters were recorded only on the teeth to be treated at baseline, and 3 and 6 months after surgery. The CEJ was used as the fixed reference point. In cases where the CEJ was not clearly visible, a lower border of the groove on acrylic stent, which covered the experimental tooth, was used as a reference point. With the acrylic stent in position, the periodontal probe was inserted into the crevicular space at the angle necessary to reach the deepest area of the defect. A pencil mark was made when the probe made contact with the stent. Longitudinal grooves were then made on the stent with acrylic trimming burs. 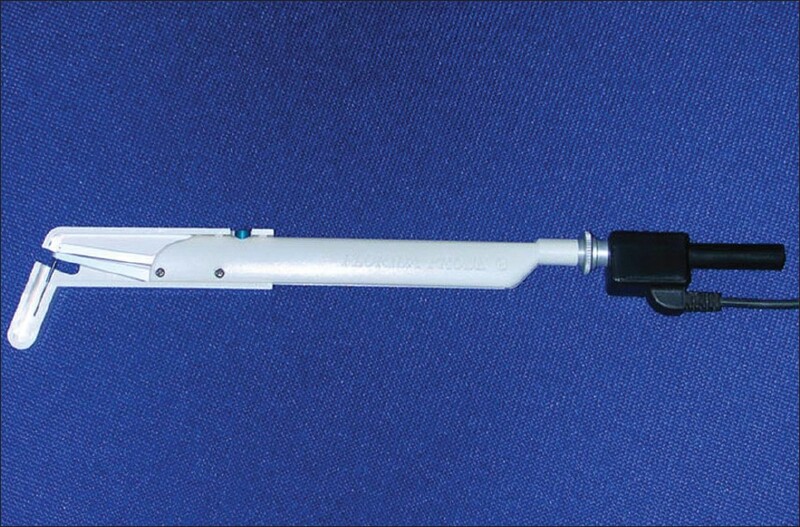 Using the groove as a guide, Florida probe was inserted into the pocket to measure PPD. PPD was recorded by the following method. The Florida probe tip was placed at the base of the pocket and the sleeve of probe was brought at the gingival margin. The foot-pedal was then pressed. Probing depth was recorded automatically as the distance between the gingival margin and the probe tip (base of the pocket). Measurement of GR was a two-step procedure. 1st Step: Probe tip was placed at the base of the pocket, and when the sleeve was at the level of CEJ, the foot-pedal was pressed. 2nd Step: Probe tip was placed at base of the pocket, and when the sleeve was at the level of gingival margin, the foot-pedal was pressed. The gingival recession was recorded automatically as the difference between these two readings, i.e. distance between CEJ and gingival margin. 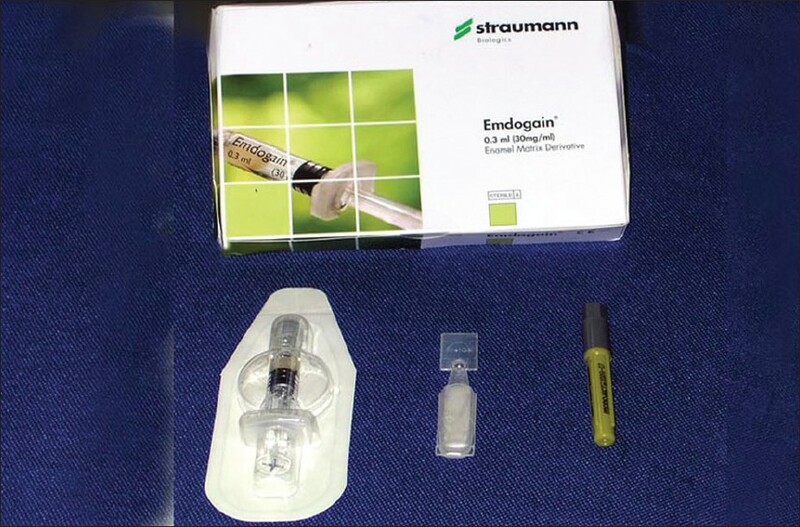 After induction of local anesthesia (2% Lidocaine, epinephrine 1:100,000), the exposed root surfaces was carefully planed with curettes and ultrasonic instruments. 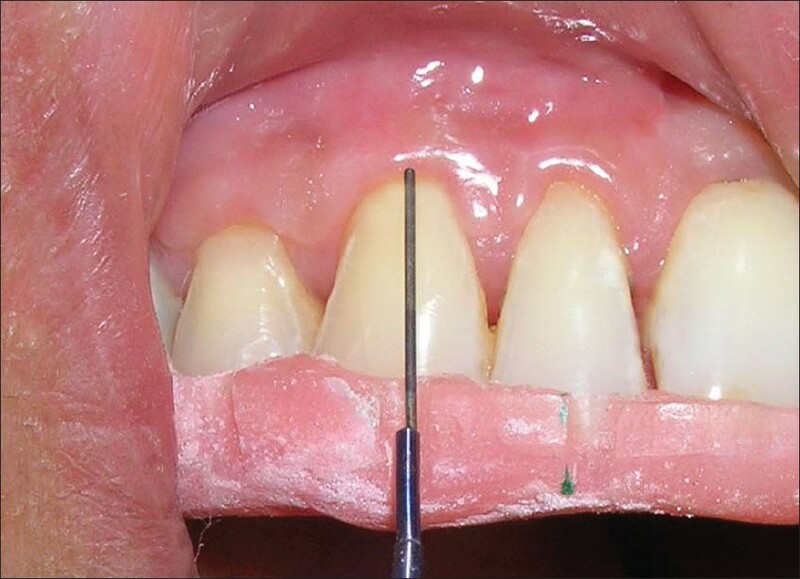 Intra-sulcular incision was made at the buccal aspect of recession, and the incision was extended horizontally into the adjacent interdental areas slightly coronal to the CEJ without interfering with the gingival margin of the neighboring teeth. Two oblique vertical incisions mesial and distal to selected sites were extended beyond the mucogingival junction and a trapezoidal mucoperiosteal flap was raised up to the mucogingival junction. After this point, a split thickness flap was extended apically, releasing the tension and favoring the coronal positioning of the flap. 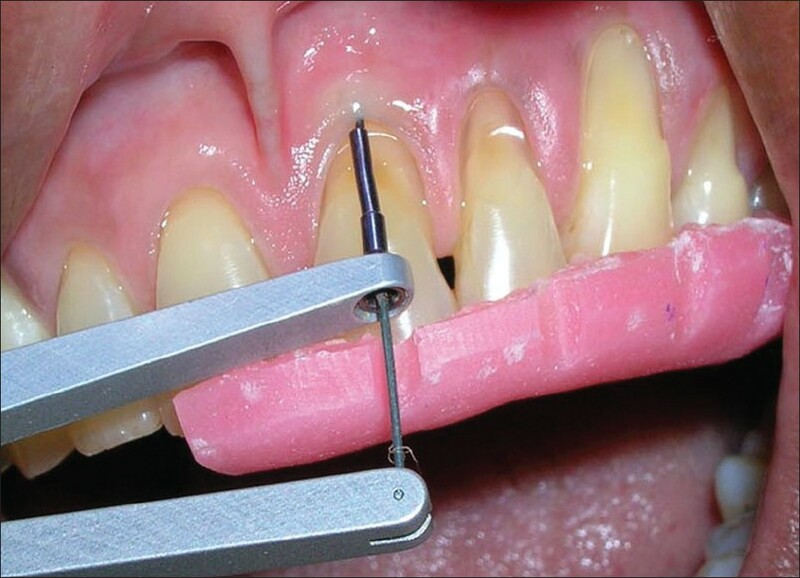 The facial portion of the interdental papillae was de-epithelized to create a connective tissue bed for suturing the CAF. The exposed root surfaces at test and control sites were conditioned with a 24% EDTA gel (Prefgel) for 2 minutes using a brush in order to remove the smear layer. After 24% EDTA (Prefgel) application, the area was thoroughly rinsed with saline. The root surfaces were dried and EMD (Emdogain gel) was applied to the exposed root surfaces, starting at the base of the recession using the canula provided by the manufacturer. The flap was then displaced coronally without tension at the CEJ level, fully covering the recession defects. A nonresorbable, number 5-0 vicryl suture was used to secure the CAF at the CEJ level by using interrupted or crossed horizontal suspension suturing technique. Both vertical incisions were closed with sutures. No pressure was applied to the flap after suturing. The surgical procedure at the control site was identical to the one used for the test group with the exception of EMD application. Immediately after surgery, periodontal dressing (COE-PAK™, GC America Inc., ALSIP, IL, and USA) was placed at the recipient sites in both the groups. After surgery, a nonsteroidal anti-inflammatory (IBUGESIC-Ibuprofen+Paracetamol, t.d.s. for 5 days) was prescribed. No systemic antibiotics were utilized. Patients were instructed not to brush the teeth in the treated area. All patients were placed on 0.2% chlorhexidine gluconate (Hexidine, ICPA, India) twice daily, for 1 minute, for 4-6 weeks. They were instructed not to disturb the pack and to avoid undue trauma to the treated site. One week following surgery, periodontal pack was removed. At this time, healing was observed and a second periodontal pack was placed if necessary. After irrigation with saline, polishing was done with the help of polishing paste and rubber cup, taking care that it did not traumatize the treated site. Patients were instructed to clean the treated site with cotton pellet saturated with 0.2% chlorhexidine gluconate for additional 3-6 weeks in an apico-coronal direction and later on using a soft toothbrush with Charter's method of brushing. The patients were recalled at 1, 3, and 6 months following surgical treatment. At each recall visit, scaling and polishing was performed. Clinical measurements recorded pre-operatively were repeated at 3 and 6 months postoperatively. The means and standard deviations of gingival recession, PPD, CAL, and width of keratinized gingiva (WKG) at baseline, and 3 and at 6 months post-surgery were calculated for both groups. The Student's paired t-test was used to compare the data from the baseline to those at 6 months for each treatment group. Comparisons between treatment groups at baseline and 6 months post-surgery were accomplished with the Student's unpaired t-test. Comparisons of the PI and PBI at baseline, and 3 and 6 months post-surgery were made by Student's paired t-test. Twenty systemically healthy patients, 10 patients in test group with 22 buccal/ labial recession defects and 10 patients in control group with 24 buccal/labial recession defects were treated. The test group was treated with coronally positioned flap (CPF) combined with Emdogain gel® and the control group with coronally positioned flap (CPF) alone. In the test group, the mean depth of gingival recession treated was 3.96+1.04 mm with a range of 3-7 mm [Table 1], while in the control group, the mean depth of gingival recession treated was 3.57+0.47 mm with a range of 3-4.2 mm [Table 2]. During the course of the study, wound healing was uneventful. The periodontal dressing remained in place until the first post operative appointment. There were no post operative complications in any patient. None of the selected patient dropped out before the termination of the study. 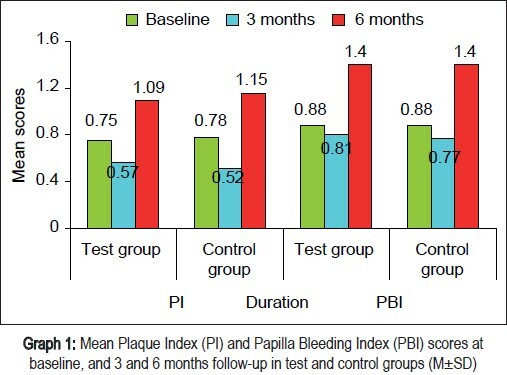 [[Table 3], Graph 1] shows the mean plaque index (PI) and papilla bleeding index (PBI) scores at baseline, 3 months and 6 months after surgery. In the test group, the mean PI score had decreased at 3 months (0.57+0.06) compared to the baseline score (0.75+0.11), and the difference was not statistically significant. However, at 6 months, the mean PI was increased to 1.09+0.11 and the difference was found to be significant when compared to the baseline PI values. In the control group, the mean PI score had decreased at 3 months (0.52+0.06) compared to the baseline score (0.78+0.07), and the difference was not statistically significant. However, at 6 months, the mean PI was increased to 1.09+0.11 and the difference was found to be significant when compared to the baseline PI values. At baseline the PBI score was 0.88+0.08 in test group and 0.88+0.07 in control group. 3 months after the surgery it was decreased to 0.81+0.1 in test group and 0.77+0.12 in control group, and the difference was not significant. But the mean PBI score was increased from 0.88+0.08 to 1.40+0.25 in test group and from 0.88+0.07 to 1.40+0.3 in control group at 6 months and the difference were found to be statistically significant. During 3 to 6 months study period both PI and PBI scores were significantly increased in spite of repeated oral hygiene instructions at regular intervals. At baseline mean gingival recession (REC) was 3.96+1.04mm in the test group and 3.56+0.47mm in the control group. Similarly, probing pocket depth (PPD) was 0.98+0.20mm in the test group and 0.98+0.07mm in the control group. Mean clinical attachment level (CAL) was 4.93+1.03mm in the test group and 4.54+0.50mm in the control group, while width of keratinized gingiva (WKG) was 3.23+0.43mm in the test group and 3.58+0.50mm in the control group [Graph 2]. At baseline, no statistically significant differences in any of the investigated parameters were observed between the Test and control groups (P>0.05), indicating that the randomization process was effective. In the test group, mean depth of gingival recession at baseline was 3.96+1.04mm and at the 6 months follow up it was decreased to 0.56+0.55 mm , with a mean reduction of 3.4+0.97 mm [Table 4], [Figure 5] and [Figure 6]. Students paired t-test indicated that the mean REC reduction at 6 months was statistically significant (P<0.05) compared to the baseline value. This corresponds to mean root coverage of 86.30+12.20 percent in test group at 6 months postoperatively [Table 4], [Figure 6]. The mean pocket depth was decreased from 0.98+0.2mm at baseline to 0.74+0.15mm at 6 months in the test group. The mean PPD reduction (0.23+0.17mm) at 6 months was statistically significant (P<0.05) compared to the baseline data [Table 1]. The mean clinical attachment level (CAL) at baseline was 4.93+1.03 mm and at 6 months it was 1.22+0.42 mm with a mean gain of clinical attachment level 3.70+1.00 mm, in the test group. Students paired t-test indicated that, the mean CAL gain at 6 months was statistically significant (P<0.05) when compared to the baseline value [Table 1]. The mean width of keratinized gingiva (WKG) at baseline for the test group was 3.23+0.43 mm and at 6 months, it was 6.18+0.59 mm. Thus, there was a significant increase in the WKG (mean 2.95+0.57 mm) at 6 months when compared to the baseline value [Table 1]. In the control group the mean depth of gingival recession was 3.56+ 0.47mm at baseline and at 6 months follow up, it was decreased to 0.75+0.44 mm with a mean reduction of 2.81+0.41mm [Table 2], [Figure 3] and [Figure 4]. Students paired t- test indicated that the mean REC reduction at 6 months was statistically significant (P<0.05) compared to the baseline value. This value corresponds to mean root coverage of 79.56+11.17 percent in the control group at 6 months postoperatively [Table 4]. The mean probing depth was decreased from 0.97+0.006mm at baseline to 1.0+0.0 mm at 6 months in the control group, with a mean reduction of 0.025+0.06 mm. The PPD reduction at 6 months was not statistically significant (P>0.05) when compared to the baseline data. The mean clinical attachment level (CAL) at the baseline was 4.54+0.5mm and at 6 months it was 1.75+0.49 mm with a mean gain in clinical attachment level of 2.79±0.41mm in the control group. The mean CAL gain at 6 months was statistically significant (P<0.05) compared to the baseline value [Table 5]. The mean width of keratinized gingiva (WKG) at baseline for control group was 3.58+0.5 mm, and at 6 months it was 6.25+0.79 mm with a mean increase in WKG of 2.66±0.56 mm at 6 months, which was statistically significant (P<0.05) when compared to the baseline value. At 6 months, mean gingival recession in the test group (3.41+0.97mm) when compared with mean gingival recession in the control group, 2.81±0.41mm a greater reduction of mean 0.58+0.21mm was demonstrated in the test group compared to the control group. When the reductions of mean gingival recession in both the groups were analyzed by student's unpaired t- test, the difference was statistically significant [[Table 4], Graph 2]. At 6 months the mean root coverage attained in the test group was 86.30 percent and 79.56 percent in control group which corresponds with a mean recession reduction of 3.41+0.97 mm in the test group and 2.81+0.41mm in the control group [[Table 4], Graph 2]. When comparison was made between test and control groups at 6 months, by using students unpaired t-test, the difference of root coverage between the test and the control group was statistically significant (P<0.05). The mean PPD reduction in test group (0.23+0.17 mm) at 6 months when compared with mean PPD reduction in control group (0.002+0.006 mm), the difference was statistically significant (P<0.05). At 6 months, the mean CAL gain in test group (3.70+1.00 mm) when compared with the CAL gain in control group (2.79+0.49 mm), the difference in CAL gain was statistically significant (P<0.05). The mean increase in the width of keratinized gingiva (WKG) in the test group (2.95+0.97 mm) at 6 months, when compared with the mean increase WKG in control group (2.66+0.56 mm), the difference in WKG was not statistically significant [[Table 5], Graph 2]. Treatment of gingival recession has become an important therapeutic issue due to the increasing number of cosmetic requests from the patients. Even if complete root coverage is surgically accomplished, the result may not be completely satisfactory in the case of excessive thickness or poor blending of the area. This happens very frequently when a free or connective tissue graft is harvested from the palate and utilized for root coverage. Another factor to be considered is that the gingival recession is seldom localized to a single tooth. More frequently, gingival recession affects group of adjacent teeth. In order to minimize the number of surgeries and to optimize the esthetic result, all the contiguous recession should be treated at the same time. The CPF procedure has been demonstrated to be a reliable, simple, and predictable modality for root coverage in multiple types of gingival recession. Data from this study demonstrated that a significant improvement was present from baseline recession depth to depth at 6 months (3.40±0.97 mm for the test group and 2.81±0.41 mm for the control group) and in the percentage of root coverage (86.30% and 79.56%, respectively) [Table 1], [Table 2] and [Table 4]. There was a statistically significant higher percentage of root coverage and more reduction of recession depth in the test group than in the control group at 6 months [Table 4] and [Table 5]. These findings are within the range reported by Castellanos et al. (2006)  and Prato et al. (2000),  where they found 88.6% and 62.2% of root coverage in patients treated with EMD+CPF and CPF alone, respectively, after 12 months. In the present study, there was a significant increase in the mean WKG in both the groups (2.95±0.57 mm in the test group and 2.65±0.56 mm in the control group) [Table 1] & [Table 2] and [Figure 2]. But no statistically significant difference was found between both the groups at any point of time (0.28±1.6 mm) [[Table 5], Graph 2]. These findings are in accordance with the reports of Modica (2000),  McGuire (2003),  and Hagewald (2002),  where the authors reported a range of 0.20-7 mm increase in WKG at 6-12 months. The most reliable outcome variable for assessing for periodontal regeneration is human histology. Due to ethical considerations and patient management limitations, no histologic evidence was obtained to establish whether healing took place by repair or by new connective tissue attachment. 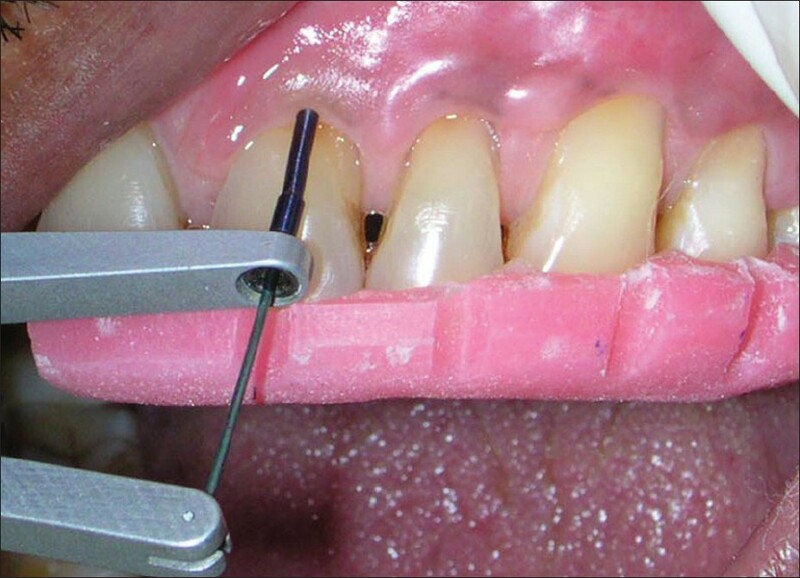 The importance of plaque control cannot be overstated in periodontal therapy. In the present study, both mean plaque scores (PI) and papilla bleeding score (PBI) were significantly increased at 6 months compared to the values observed at 3 months [[Table 3], Graph 1]. The patients' postoperative plaque control levels could have been responsible for the variations in all parameters, recorded at 3 and 6 months. Within the limitations of the study it can be concluded that the application of EMD (Emdogain gel) resulted in a statistically significant increase in root coverage, gain in the CAL, and PPD reduction when compared with CAF alone, but there was no statistically significant difference in the WKG between the two groups. 1. Heijl L. Periodontal regeneration with enamel matrix derivative in human experimental defects. J Clin Periodontol 1997;24:693-6. 2. Harris RJ. Treatment of a cracked tooth with a Resin-Ionomer Restoration and a connective tissue graft: A case report. Int J Periodontics Restorative Dent 1994;20:613-7. 3. Caffesse R, Guinard E. Treatment of localised recessions. J Periodontol 1987;51:167-70. 4. Allen EP, Miller PD Jr. Coronal positioning of existing gingiva: Short term results in the treatment of shallow marginal tissue recession. J Periodontol 1989;21:1-4. 5. Bernimoulin JP, Luscher B, Muhlemann HR. Coronally repositioned flap. Clinica evaluation after one year. J Clin Periodontol 1975;2:1-13. 6. Wennstrom JL, Zucchelli G. Increased gingival dimensions. A significant factor for successful outcome of root coverage procedure? A 2 year clinical study. J Clin Periodontol 1996;23:770- 7. 7. Aichelmann-Reidy ME, Yukna RA, Evans GH, Nasr HF, Mayer ET. Clinical evaluation of acellular allograft dermis for the treatment of human gingival recession. J Periodontol 2001;72:998-1005. 8. Harris RJ. A comparative study of root coverage obtained with guided tissue regeneration utilizing bioabsorbale membrane versus the connective tissue with partial thickness double pedicle. J Periodontol 1997;68:779-90. 9. Zuccheli G, Clauser C, De Sanctis. Mucogingival versus GTR procedures in the treatment of deep recession type defect. J Periodontol 1998;69:138-45. 10. Gestrellus S, Lyngstadaas SP, Hammarstrom L. Emdogain periodontal regenerative based on biomimicary. Clin Oral Investig 2000;4:120-5. 11. Castellanos T, Manuel de la R, Raul G. Caffesse.Enamel matrix derivative and coronal flaps to cover marginal tissue recessions. J Periodontol 2006;77:7-14. 12. Pini Prato G, Pagliaro U, Baldi C, Nieri M, Saletta D, Cairo F, et al. Coronally advanced flap procedure for root coverage. Flap with tension versus flap without tension. J Periodontol 2000;71:188-201. 13. Hagewald S, Spahr A, Rompola E, Haller B, Heijl L, Bernimoulin JP. Comparative study of Emdogain and coronally advanced flap technique in the treatment of human gingival recessions. J Clin Periodontol 2002;29:35-41. 14. Modica F, Del Pizzo M, Roccuzzo M, Romagnoli R. Coronally advanced flap for the treatment of buccal gingival recessions with and without enamel matrix derivatives. J Periodontol 2000;71:1693-8. 15. McGuire MK, Cochran DL. Evaluation of human recession defects treated with coronally advanced flaps and either Enamel matrix derivatives or connective tissue Part-II: Histological evaluation. J Periodontol 2003;74:1126-35.